The 94th Aero Squadron is located between the runways of the Port Columbus International Airport and offers a dramatic view of the arriving and departing air traffic. 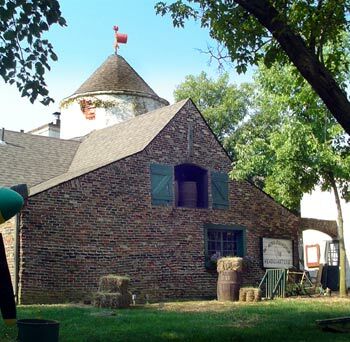 The old country French Farmhouse is full of military memorabilia and aviation relics depicting the times of the World War I and World War II era. The interior of the restaurant is cozy and romantic with huge stone fireplaces, wood paneling and beamed ceilings. 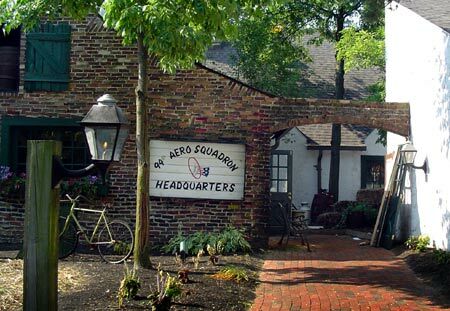 The 94th Aero Squadron serves fine American cuisine for lunch and dinner. Generous portions and homemade quality is our trademark. The menu features prime rib, hand cut steaks, fresh seafood and home style favorites. The 94th offers 3 private rooms for banquets of 25-150. The rooms provide a unique setting for a casual to most elegant event. Call their banquet coordinator at 614-237-8887 for more information. in September 1917, two officers and 150 enlisted men left Texas for France and were sent to seven different aircraft factories for maintenance and repair training. In April 1918, the 94th was reunited and stationed at the Gencoult Aerodrome in Toul, France, where it began operations as the first American squadron at the front. In April of 1918, Lt. Douglas Campbell, who later became America's first Ace pilot, and Lt. Alan Winslow downed 2 German aircraft. These were the first victories scored by an American unit. Through to the end of the war in November 1918, the "Hat in the Ring" insignia remained synonymous with unparalleled success. No 94th pilot typified this success more than First Lt. Edward Vernon Rickenbacker, the "Ace of Aces." In the Nieuport 28 and later in the Spad XIII, was credited with 26 of the squadron's 70 kills, an accomplishment unparalleled by any other American airman. By the end of hostilities, the 94th had won battle honors for participation in 11 major engagements and was awarded the Croix-de-Guerre. In November 1942, the newly re-designated 94th Fighter Squadron went back to war. Based in Africa for 2 years, the 94th again distinguished itself in combat by winning 2 Presidential Distinguished Unit Citations, most notably as part of the raids on the oil fields at Ploesti, Romania in August 1943. In addition, the squadron won 12 Battle Participation credits, in almost every major offensive campaign in North Africa and Europe. It was credited with 124 official kills. In one raid alone, the 94th, while working with the other 2 squadrons of the 1st Pursuit Group, destroyed 88 aircraft in a battle over Italy. The 94th produced a total of 6 aces in World War II. Eddie Rickenbacker, world famous flying ace-of-aces from World War I, grew up on the hard side of the streets of Columbus. He was the son of German-speaking immigrants, William and Elizabeth Rickenbacher. During the first World War, Eddie would change the spelling of the family name, changing the "H" to a "K" because he felt the name looked less German.